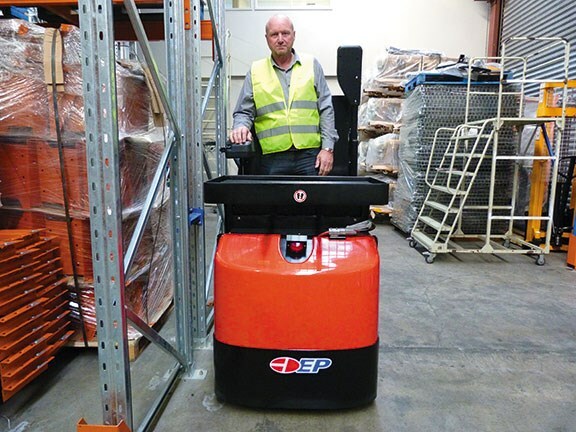 Once the domain of only the largest of warehousing operations, product-picking machines are now available to companies with smaller inventories, thanks to technological improvements in materials handling equipment. Enter the EP-CK-05 electric order picker, a unique-to-the-industry piece of equipment, designed to pick product from shelves and racking. The order packer (AKA Packer Picker) is designed for use in smaller warehouses, although it wouldn't look out of place and would be entirely adequate in much larger warehouses of ten or even twenty-thousand square feet in size. 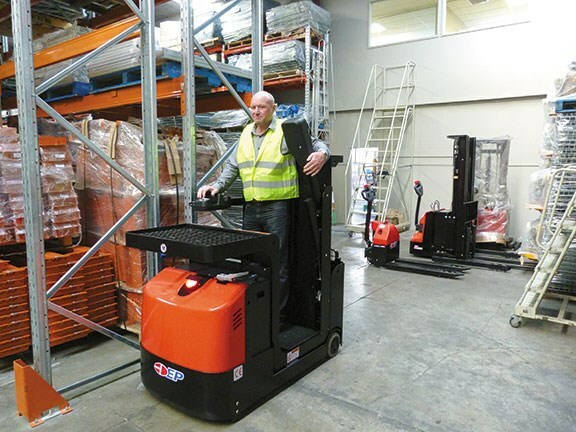 Because the machine can travel at speeds of up to 5.5kph, travel distances between warehouses even on larger industrial complexes wouldn't be too much to ask of this little beauty. Perhaps the only limitation would be the machine has a lift-height of 3.2 metres. 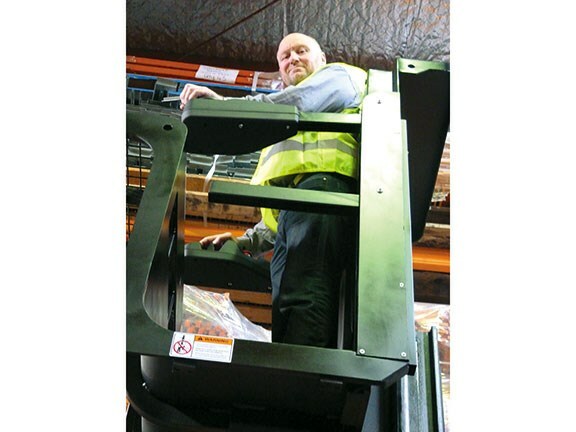 But, an average-sized warehouse person would easily be able to reach product stored 4.5 metres above the ground, depending on the depth of the shelf the product was sitting on. The machine profiled by Deals on Wheels was simple to operate and was easily mastered after a few minutes of familiarisation. The operator feels well encapsulated and totally safe. Even when operating the machine fully extended, maximum speed can be limited by a push of a button on the dashboard. The small backlit readout on the dash shows not only the maximum speed to which the limit-switch is set, but also the direction in which the wheels are pointing — a very handy safety mechanism — especially when operating the machine fully extended. The only small criticism one could make of the readout is that the display could do with being just that little bit bigger. 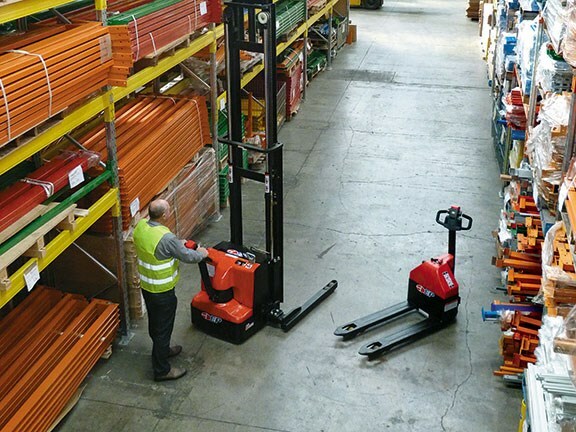 As the EP-CK-05 is not a forklift, operators don't need a special licence to climb aboard and start working the machine, making it suitable for use around the factory or warehouse for jobs other than its specific intended use as an order picker. For instance, the machine could be used by electricians and service-people, for any job ranging from changing a light bulb (or 'lamp', for any electricians reading this article) to painting a ceiling. 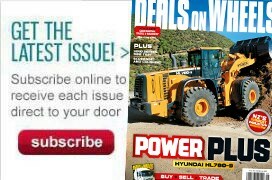 Access to the operator's compartment can be gained from both sides of the vehicle and the picker can't be operated until both safety gates are closed and the operator is encapsulated. 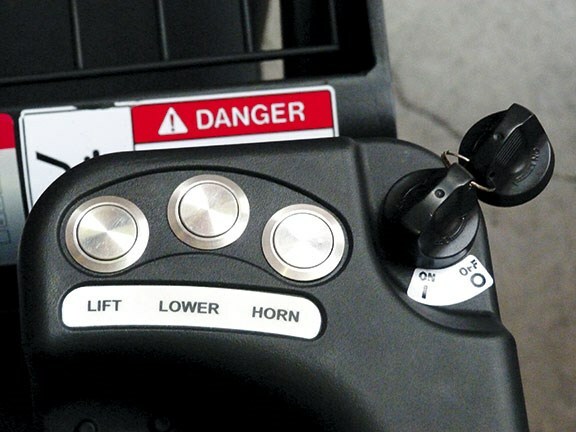 Forward and reverse motions are selected by pushing a rocker switch, which is situated on the right-hand barrier arm, as are the three buttons which operate the lift, lower and horn functions. The barrier arm also doubles as an armrest. However a lock-out switch on the floor needs to be activated before any movement forwards, backwards, up or down can be effected. Further safety devices are a red light that flashes when the key is switched to the 'on' position and a beeper that denotes all movement of the vehicle. The vehicle is steered from the left-hand barrier arm by way of a small wheel that sits on a horizontal plane with a 'spinner' attached. 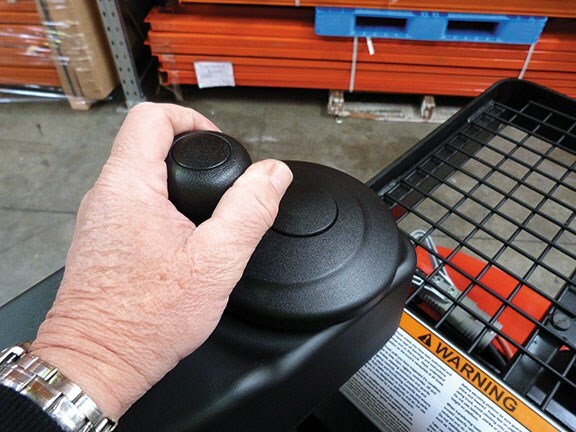 Steering can be described as 'fingertip-controlled'. The EP-CK-05 order picker won an innovation award for the best product when it appeared at the ProMat Chicago 2013 Trade Show earlier this year. It is fitted with top quality European Zapa, Iskra and Bucher electrics and has a rigid steel chassis, adding to its reliability. A fully-charged battery will normally see the order picker through a normal work-day and the charger, being a 10-amp model can be charged by plugging into a standard household electrical socket. 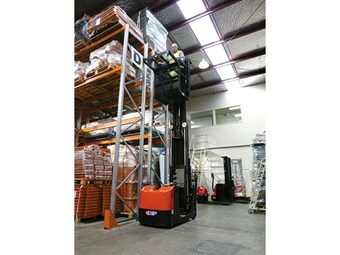 The EP-CK-05 order picker, along with all other EP electric materials handling equipment are serviced by HMS Solutions Ltd and backed by a comprehensive warranty, supported by an extensive stock of spare parts carried right here in New Zealand. For more information contact Store Pro 3 on 0800 RACKUP (722 587) or Hurricane Products Ltd on (06) 759 1990.